The town of Djenne is in central Mali in Africa and forms part of the Mopti Region, which is within the Inland Niger Delta area. Djenne was initially settled around 250 BC and had become a prosperous and large walled urban complex by 850 AD, after which it declined. Named as a 1988 UNESCO World Heritage Site, Djenne is famous for its distinctive 1907 Great Mosque of adobe (mud-brick, mud plaster coated) construction and its Sudanese-style architecture. Also for its close and historic links with Timbuktu, its ancient trans-Saharan trade in gold, slaves and salt and its Islamic scholarship (mainly circa 15-17th century). However, Djenne’s fame and prosperity declined during the 18th century when the Portuguese started establishing African coastal trading posts. Djenne is approximately 570 km north-east of the national capital of Bamako and 130 km south-west of the regional capital of Mopti. It is the major town of the historic Djenné Circle of sub-Saharan Africa’s ancient settlements. Djenne’s weather is mostly hot and dry, with the hottest months being April and May. December and January’s temperatures can be below 32 °C, however from December to March a dust-laden wind can sometimes form a haze. From July to October Djenne becomes a virtual island due to the annual flood from the Bani and Niger rivers. 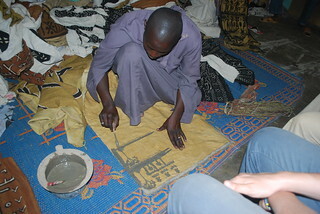 Tourism, fishing, livestock, agriculture and the trading market, together with Islamic and Quranic schools support most of Djenne’s local economy. The present Great Mosque was built on the site of an ancient mosque, by arrangement with the French colonial administration and it is out of bounds for non-Muslim tourists. Djenné’s traditional houses, of which about 2,000 have survived, are built on hillocks for protection from the seasonal floods.